This is me working in the living room floor so I could hang out with the boys on movie night. My Studio moves around. This has been a wonderful experience and learning opportunity for me. 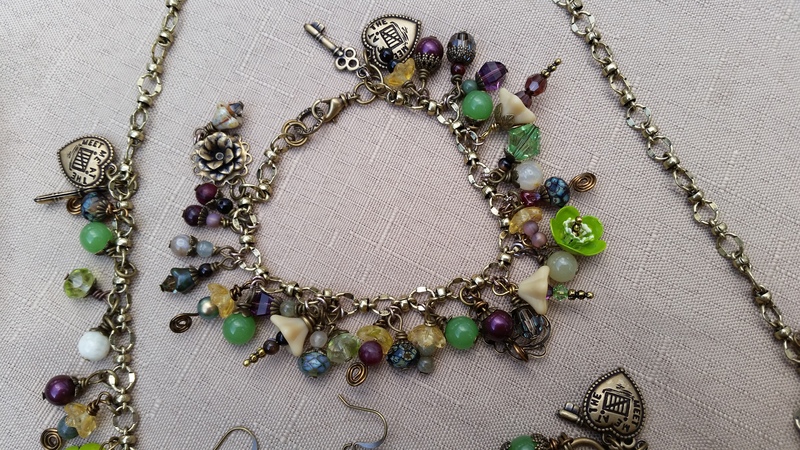 My name is Leila Belcher of LeilaBeeDesigns and I have always loved making charm jewelry. During this Challenge I discovered that I love it more than I realized. 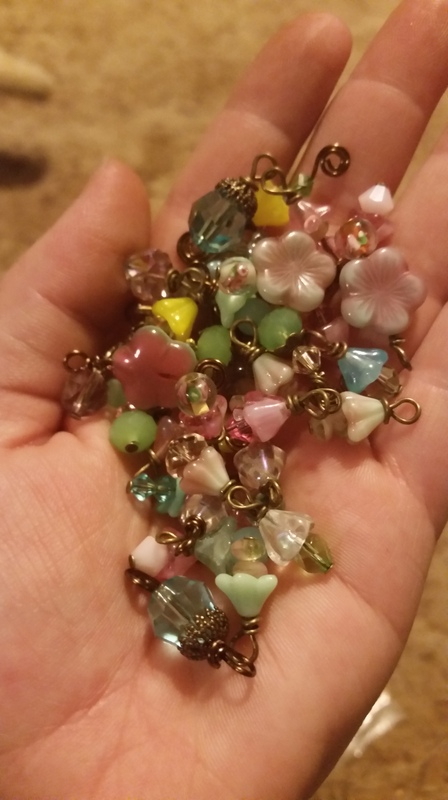 I love finding unique beads and turning them into lovely,one of a kind charms that can then be added to bracelets or necklaces. We all like to have something unique. 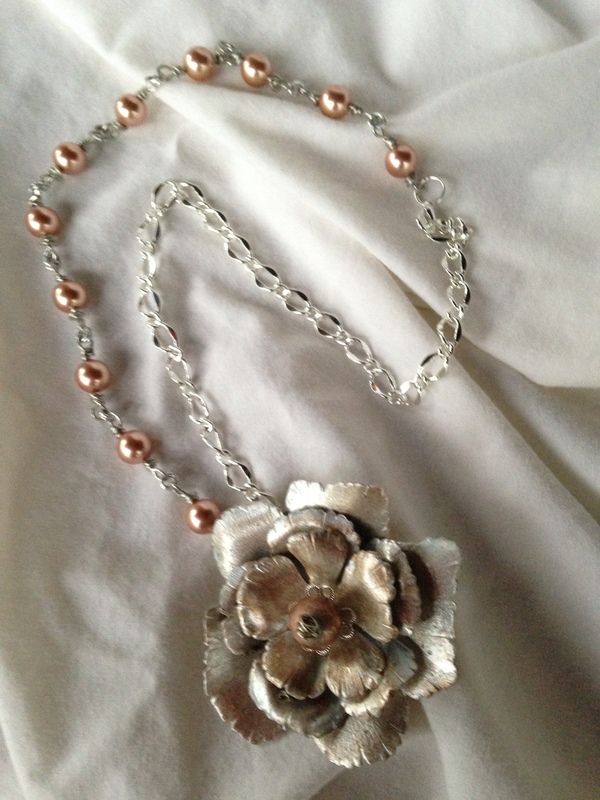 I discovered that I could make a cohesive Jewelry Line and still make one of a kind pieces. 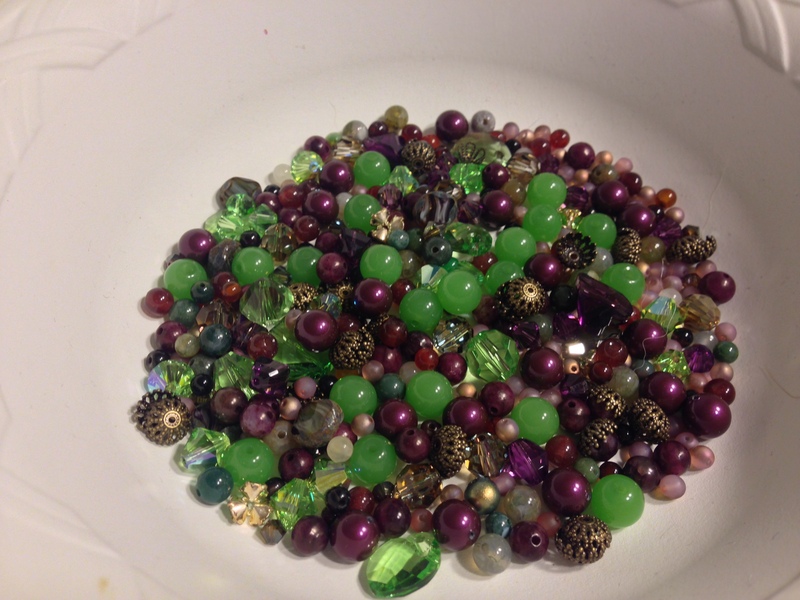 While all my Jewelry will have the same feel, flow and color scheme,no two will ever be exactly alike. 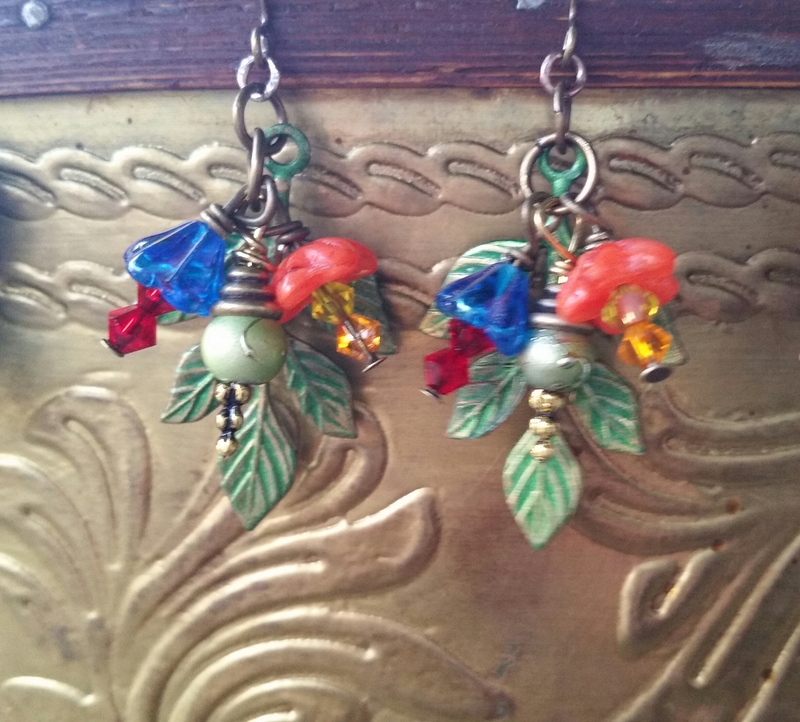 Please visit my Etsy Shop.for new listings. This line will be posted soon for purchase. 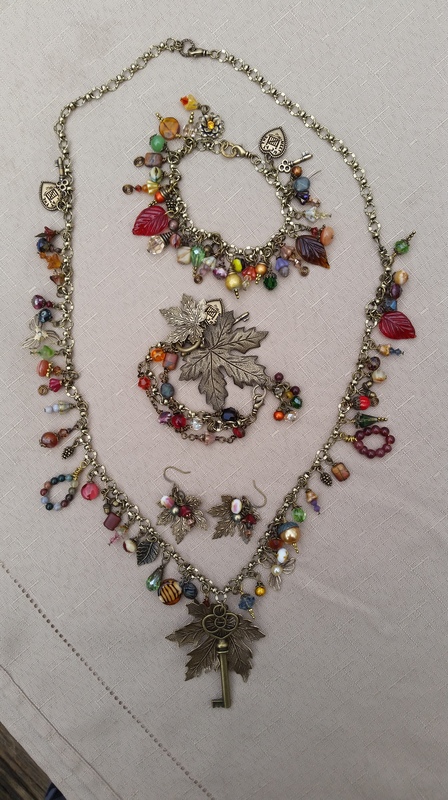 Many components of this Line came from my favorite Shop, B’Sue Boutiques and the Sponsor/Teacher/Mentor of this class, Brenda Sue Lansdowne. Be sure to visit. You won’t regret it. 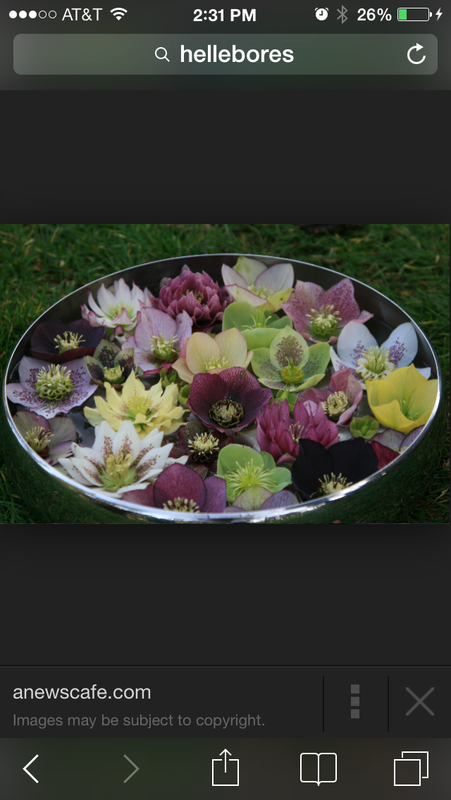 Winter – Hellebore – Colors of green, wine and cream with flowers and leaves. 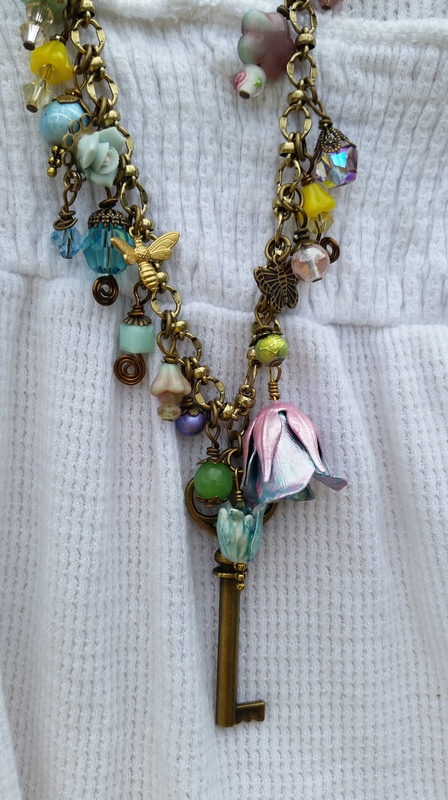 Spring – Tulip-with pastel colors of pink, blue, yellow and purple with flowers, bees, butterflies and dragonflies. 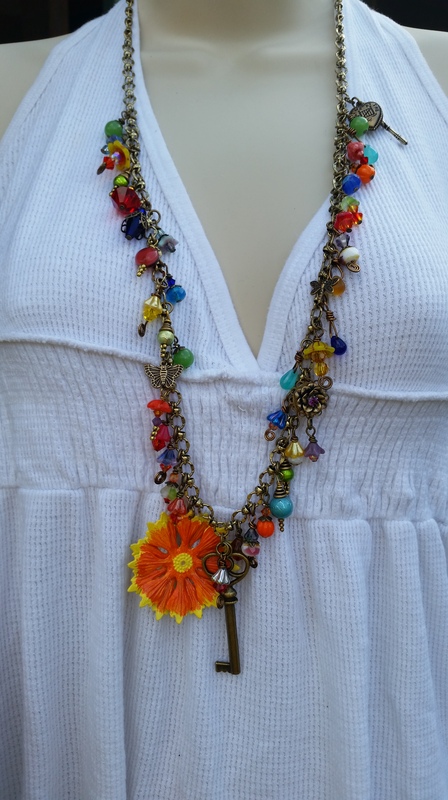 Summer – Guillardia (Blanket Flower) with bright cheerful colors of Red, yellow, blue, orange and green with butterflies, dragonflies, bees, flowers, and ladybugs. I have thoroughly enjoyed this Master Class/Contest and have learned more than I ever dreamed possible. May everyone have success with their lines and may all our dreams come true. Please see below for your next blog hop. Posted on March 20, 2015 43 Comments on Nature is the Key to Happiness – Grande Finale!!! 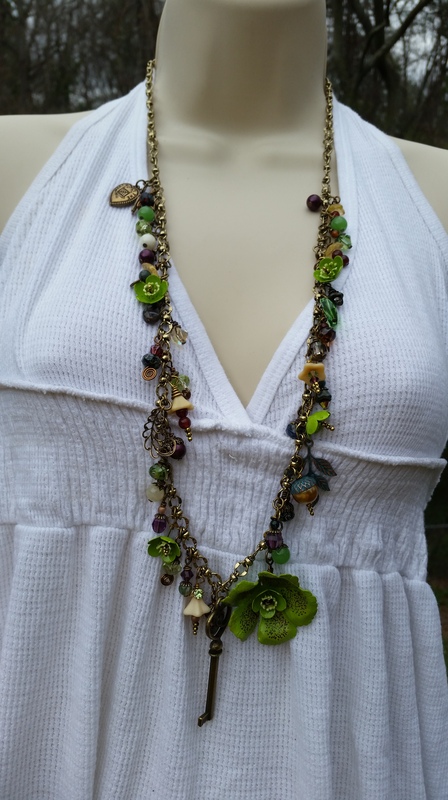 My name is Leila Belcher of LeilaBeeDesigns. 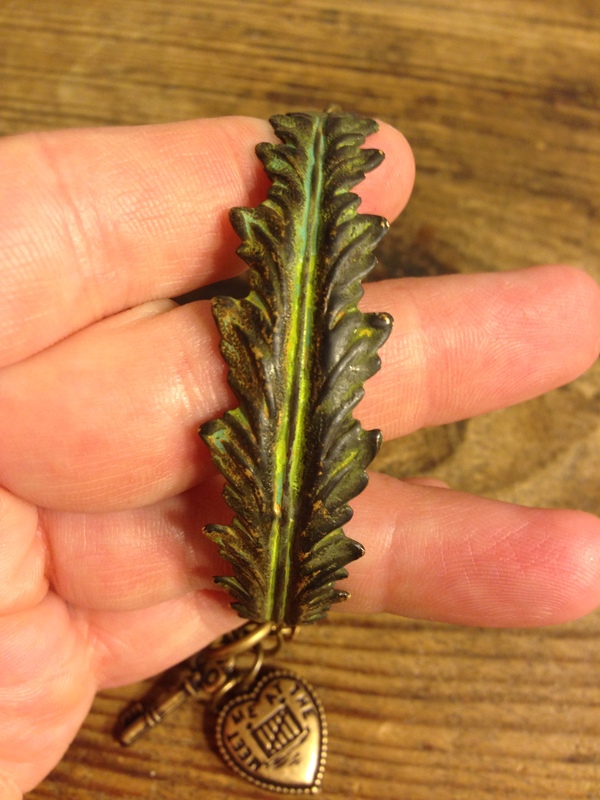 When we last left one another, I was just beginning my journey creating a Jewelry line. 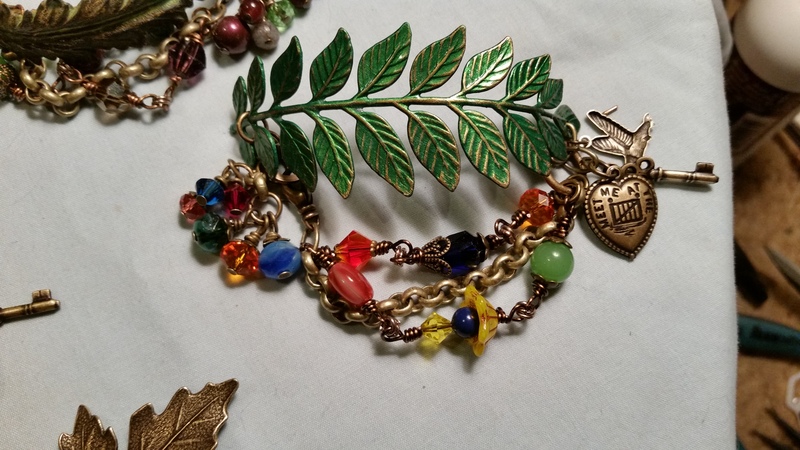 To refresh everyone’s memory I am making a line of charm jewelry based on the 4 Seasons, Spring, Summer, Fall and Winter. At the last Blog post, I basically only had my concept but I have so much more to show you this month. 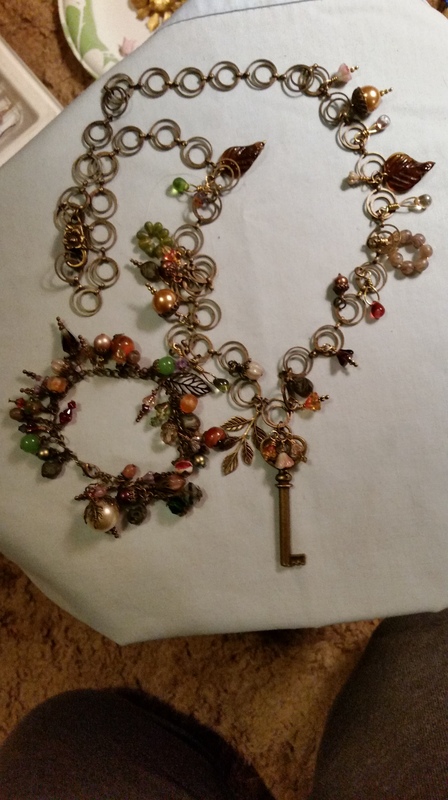 I had planned to have a completed Season to show you this time but I had a small fiasco with my chain I had planned to use. This particular chain did not come from B’Sue which was my first mistake. 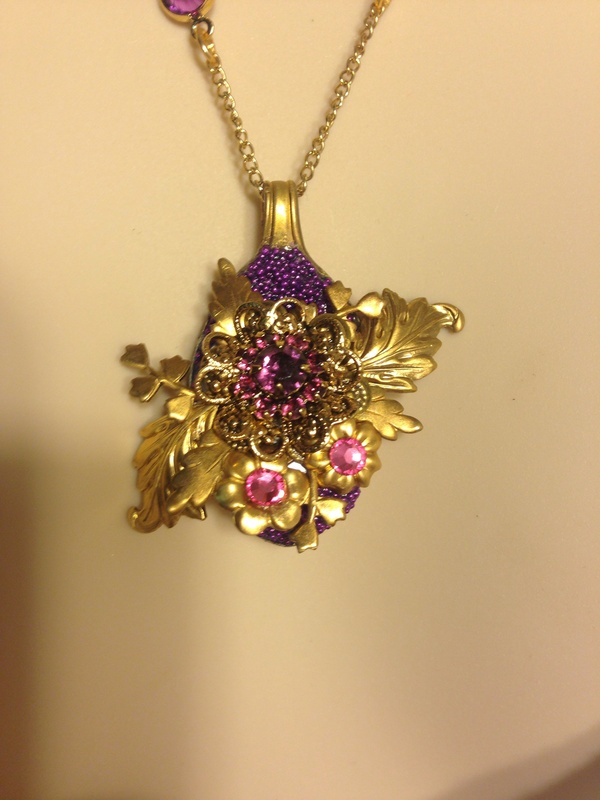 I always wear my Jewelry creations to ensure they are designed well and made well. I wouldn’t want anything to snag or break too soon as that would upset the Customer and me and prevent any future sales. So, its not good Customer Service to put a poorly made product on the Market. 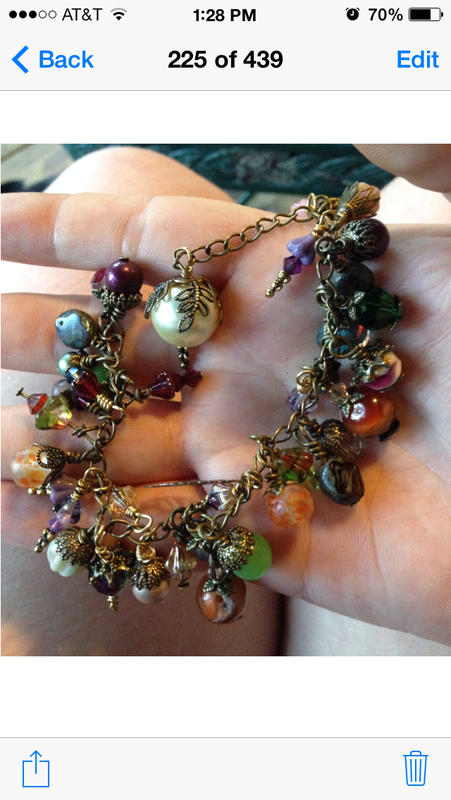 Needless to say, the bracelet snagged and broke within 3 hours of wear so I had to scrap all my chain and order some more from B’Sue Boutiques. However, I believe I have enough completed pieces to show you this time around to illustrate my Vision plus I have learned a powerful lesson. B’Sue to Begin With!! 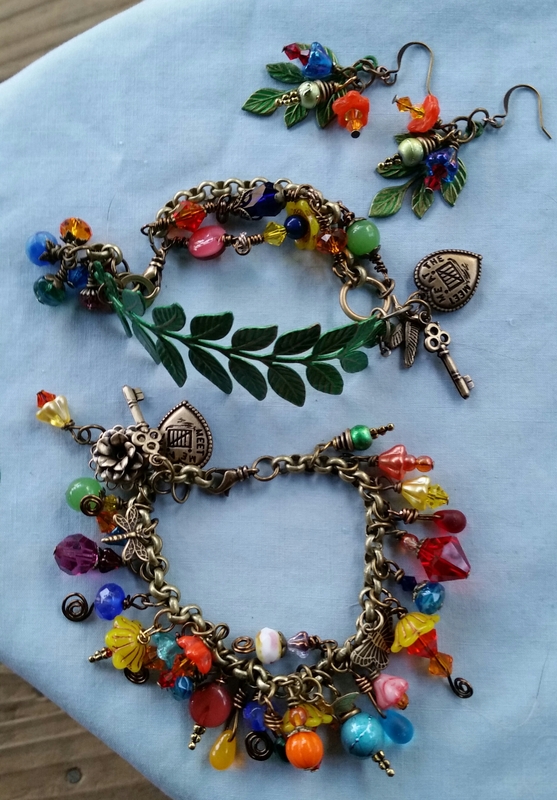 But, the best part of this goof is I love the bead and link chain from B’Sue so much better and so will customers. 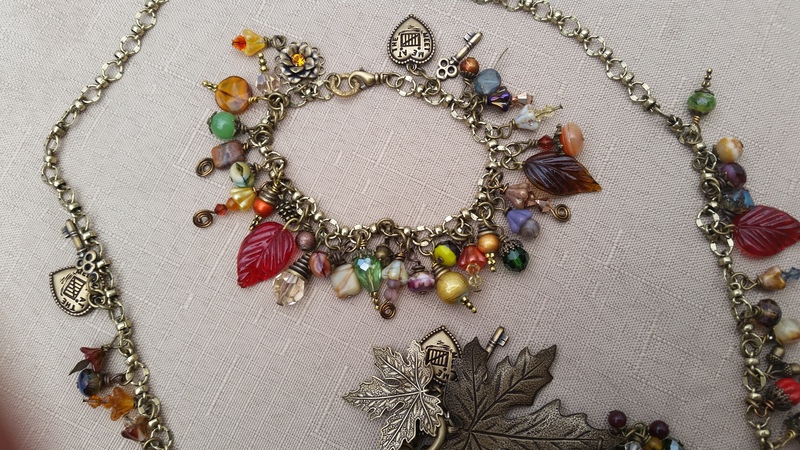 Below are the original Fall charm bracelet and necklace I played around with when forming the idea for my line. Now for pieces from my upcoming line. 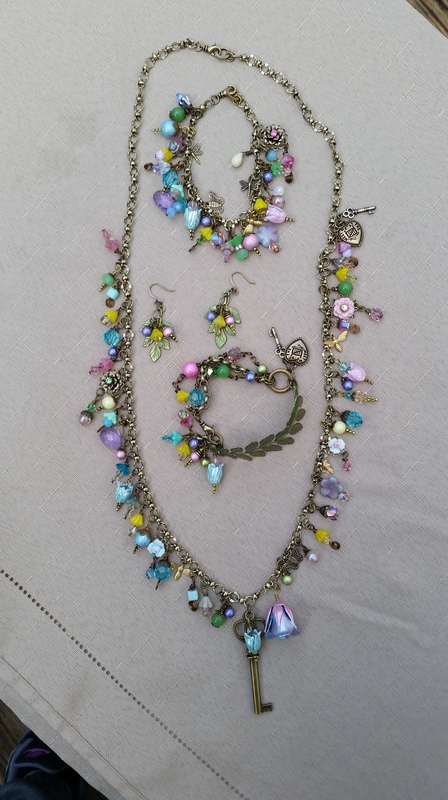 Some of these pieces are still not completely finished as they have a few extra components left to add but they are what I would consider 90% to 95% completed. 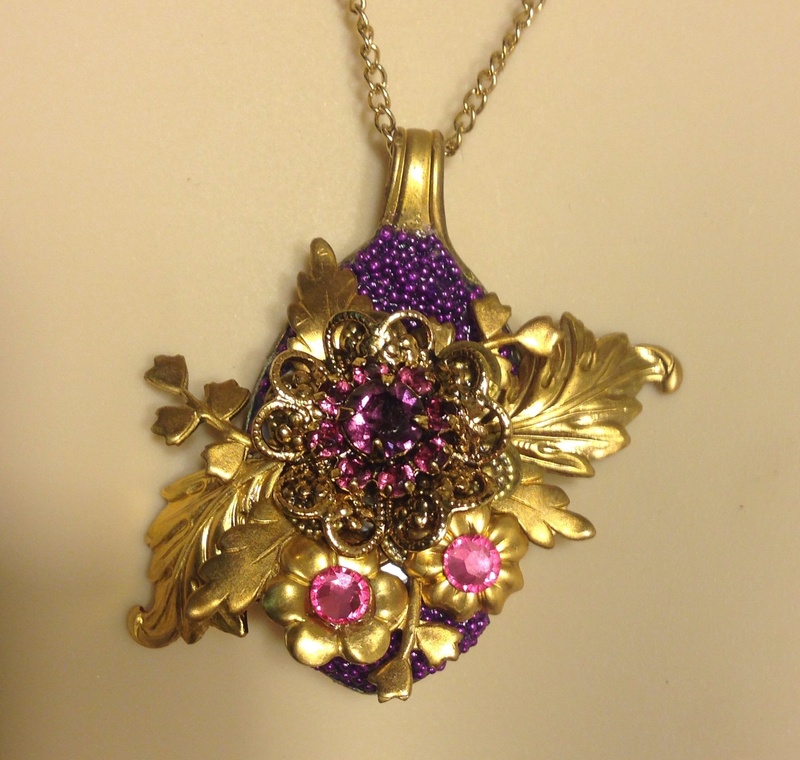 But, before I show my pieces I wanted to discuss what I have learned. Many of us have discovered that we are learning so much more than we ever dreamed possible from this challenge. 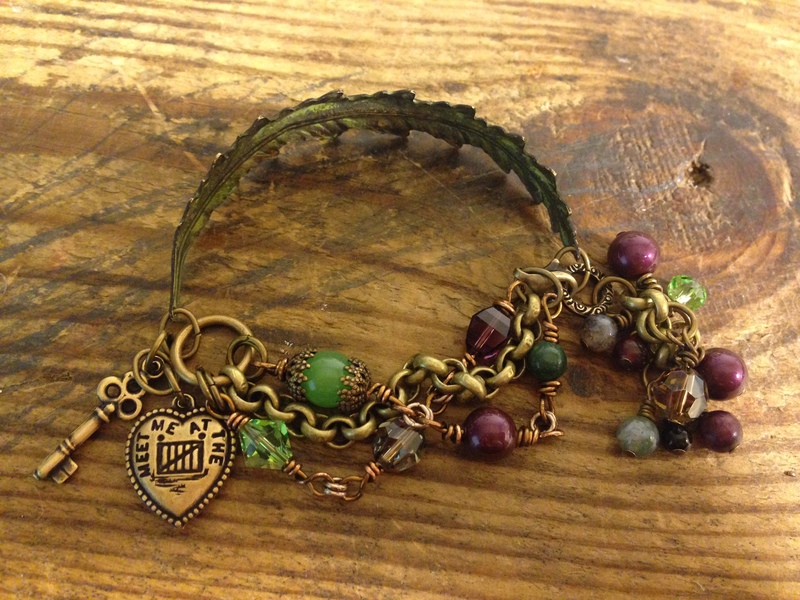 It’s become more than just how to build a line of cohesive jewelry. For many, it has changed other aspects in our lives, making us more confident and less fearful of change. 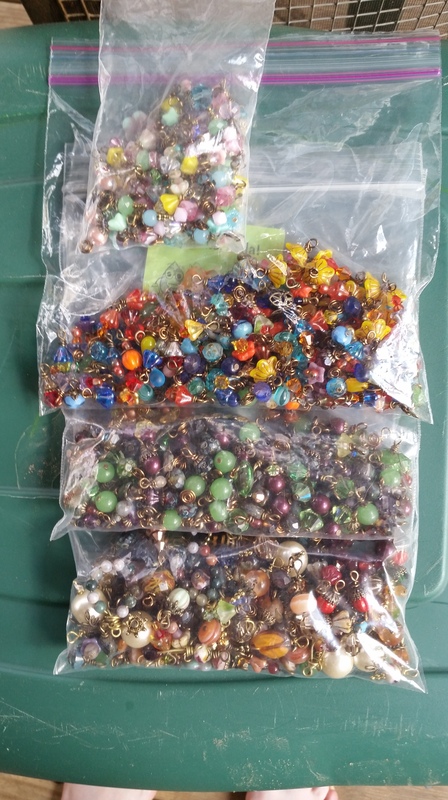 It has made many of us get more organized and serious about our Jewelry making and given us more confidence in general which has bled over into other aspects of our lives. We are learning how to become more efficient and daring. Essentially, we are coming our of our shells and GOING FOR IT!! A personal example for me is I have learned how to become more efficient. 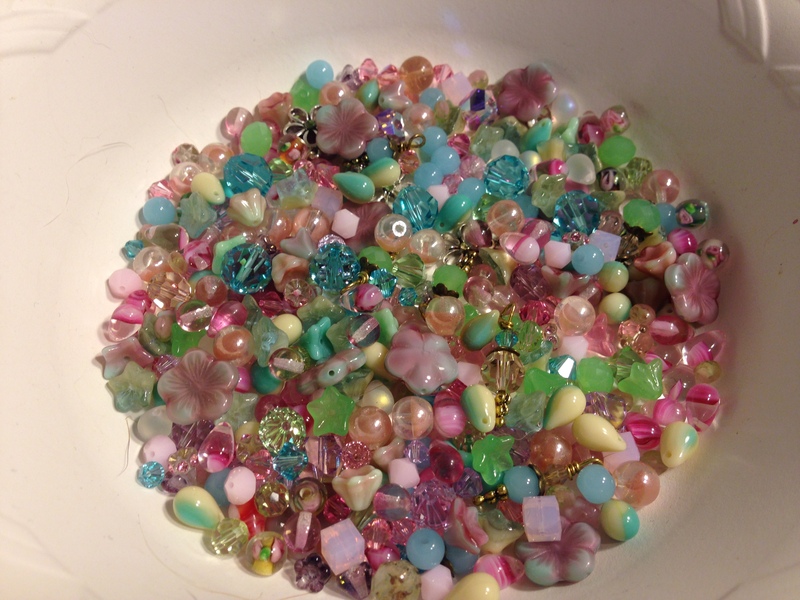 I can now make a charm in less than a minute with my assembly line method. 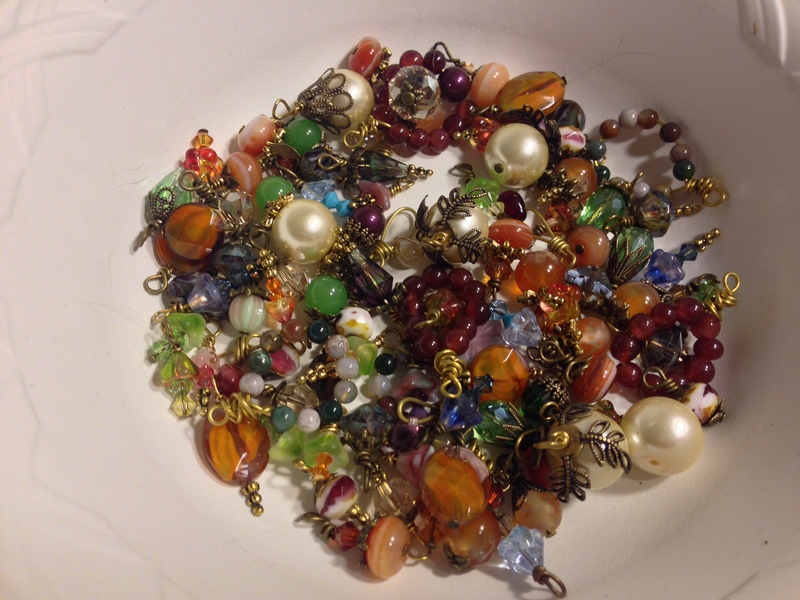 So, I made my charms in advance which cuts so much time in creating that I can make more at one time. 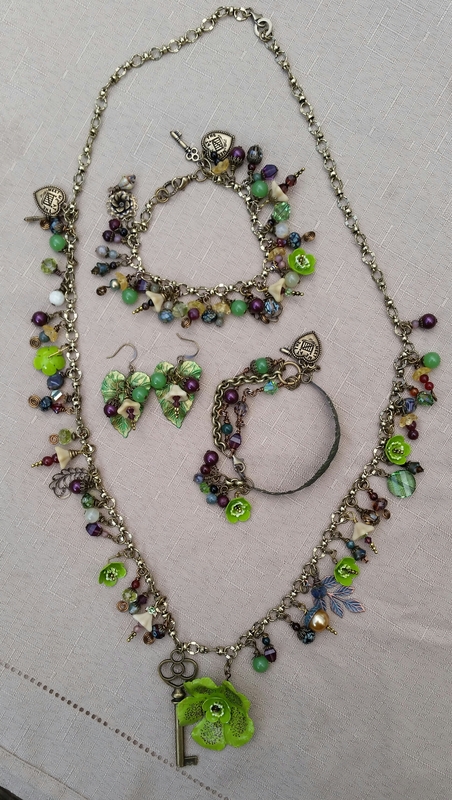 My efficiency also means I can charge lower prices as I am not spending as much time creating the pieces. 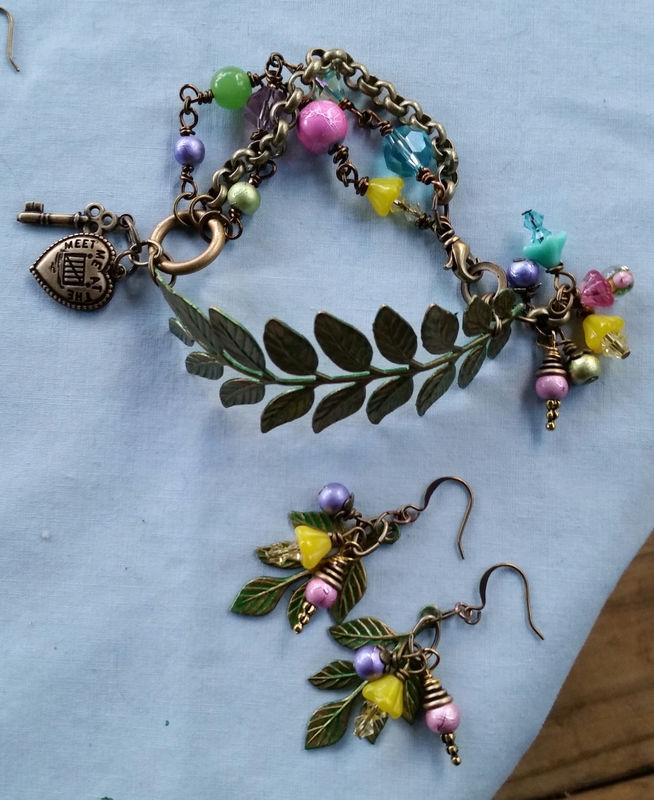 Below are some the charms I have created. The first picture is all four Seasons, the second is a handful of Fall and he third if a handful of Spring. 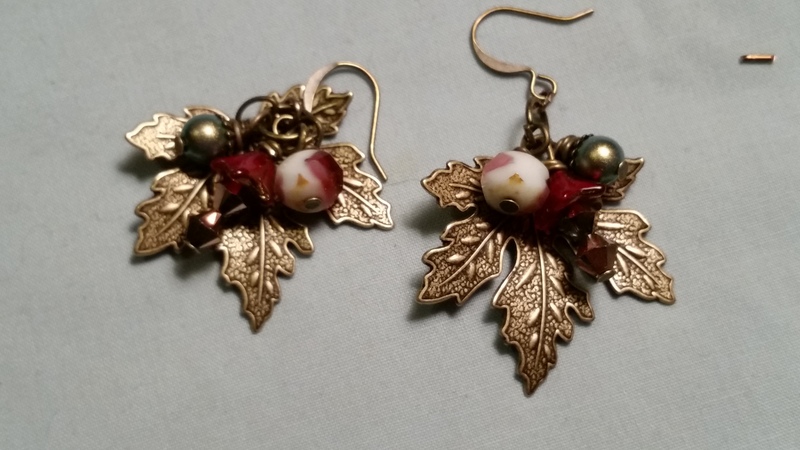 Below are earrings for each Season. Beginning with Fall, then Summer, Spring and Winter. 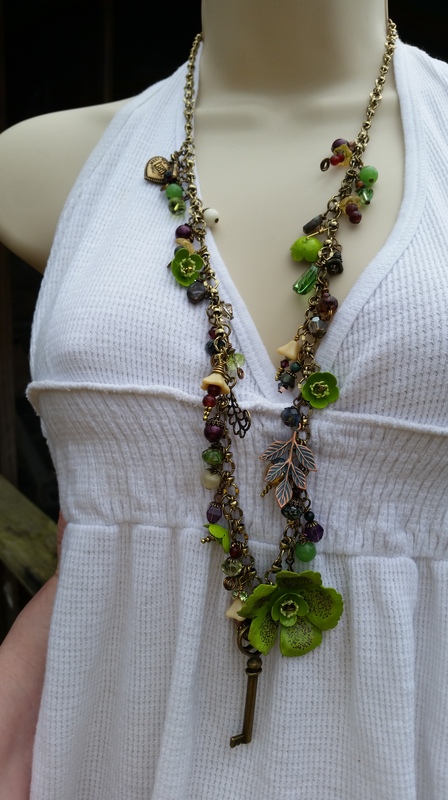 One of my fears was that I would become unhappy not making one of a kind pieces for everyone but that fear has been alleviated. 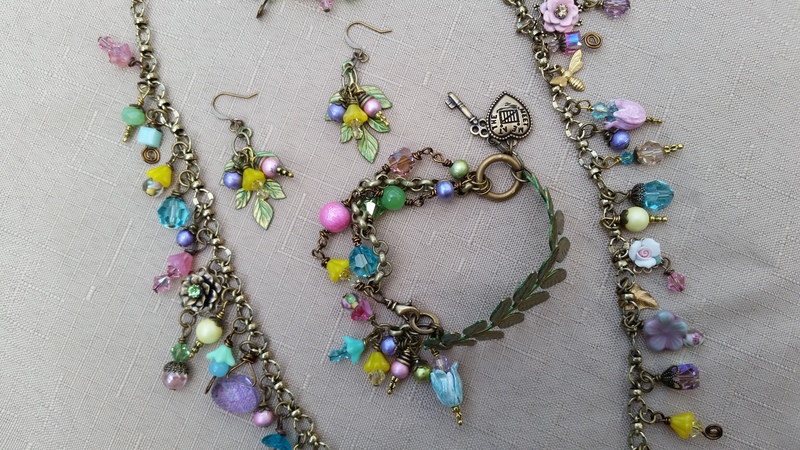 Even though I am making the same style pieces for each Season, every charm is slightly different making no two charm bracelets or necklaces identical. 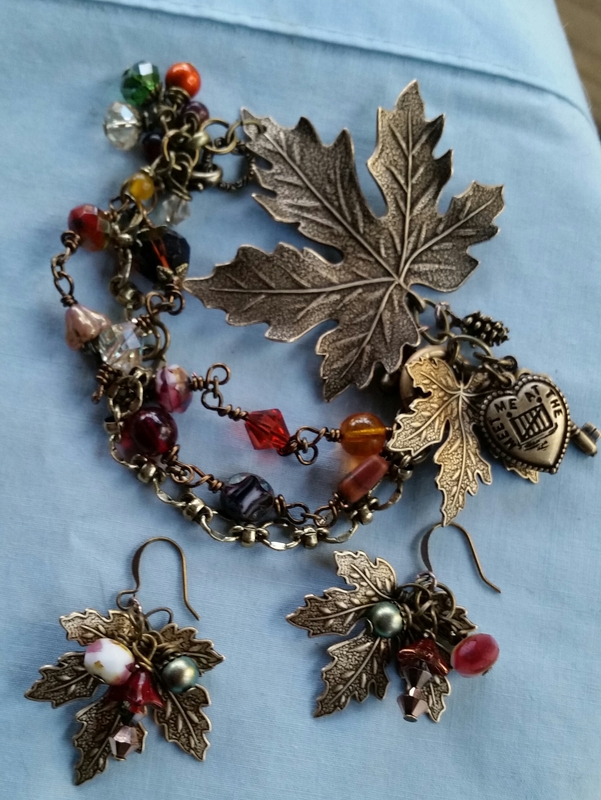 Fall Set of earrings and cuff bracelet. 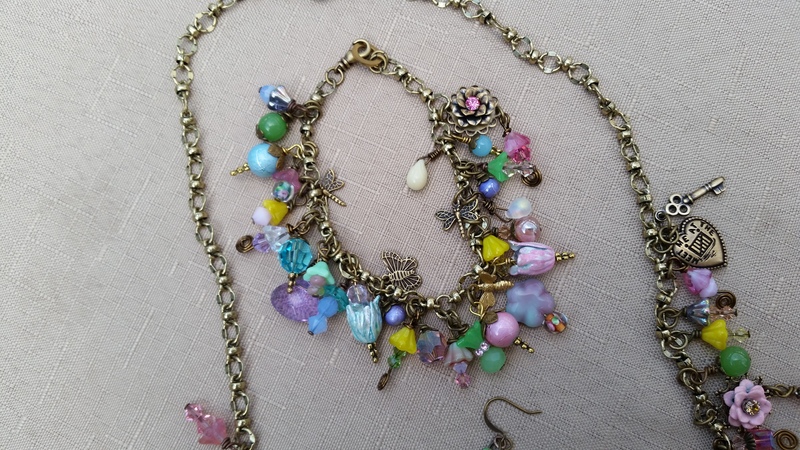 The charm bracelet and necklace will be shown on the next Blog Post. 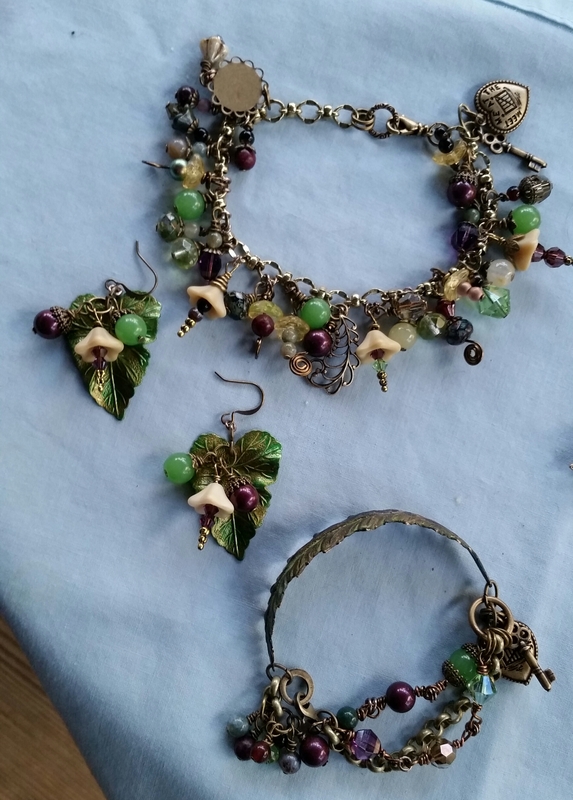 Below are the Charm bracelet, earrings and cuff bracelet for Winter. 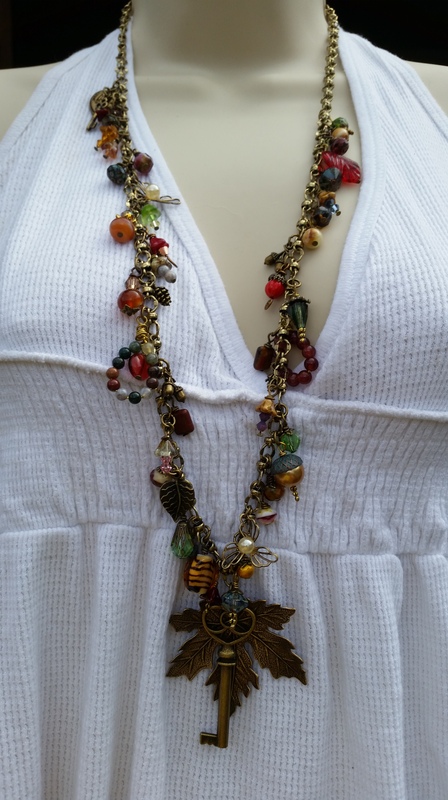 The charm necklace will be shown on the next blog post. 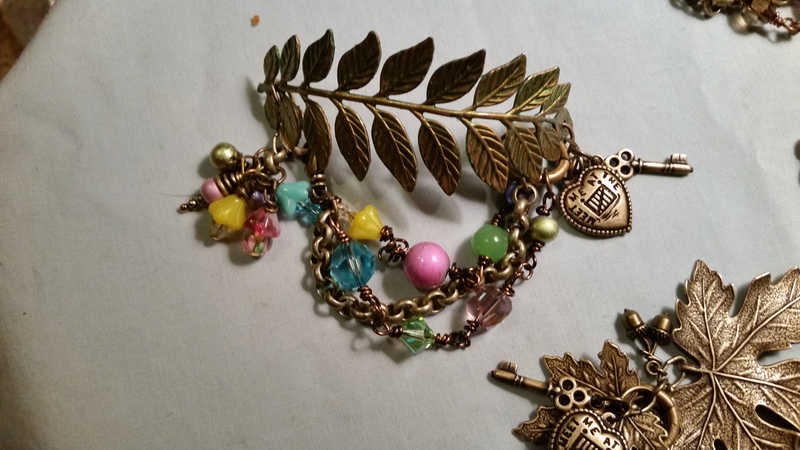 Below are the Summer charm bracelet, earrings and cuff bracelet. 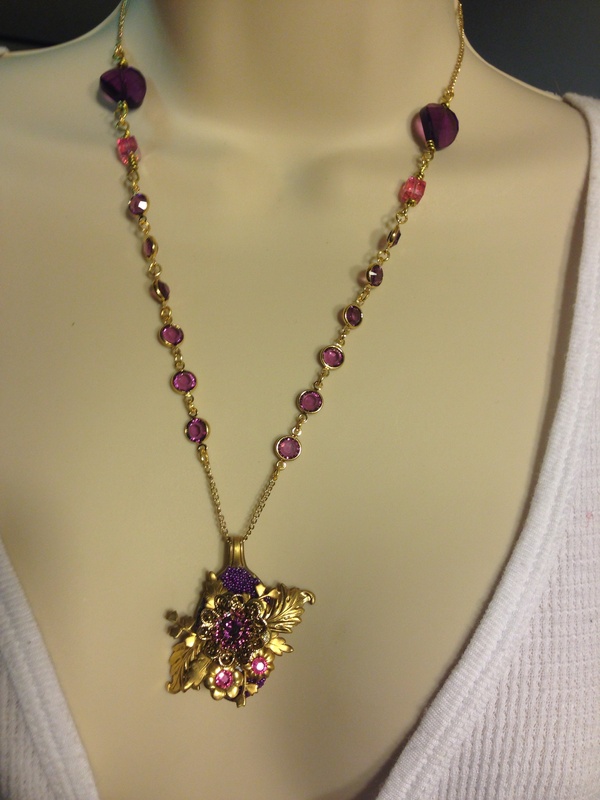 The charm necklace will be shown on the next blog post. 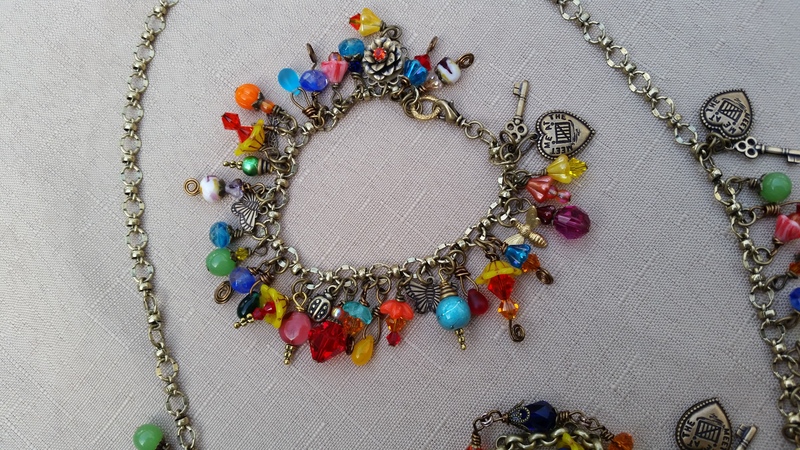 The charm bracelet has been temporarily made using Rolo chain to show the colors and styles of charms. 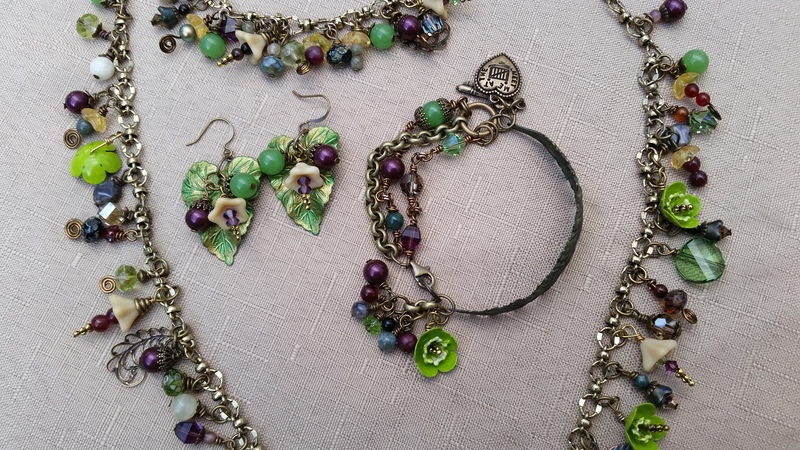 And finally, we have the cuff bracelet and earrings for Spring with the charm necklace and bracelet to be shown on the next blog post. 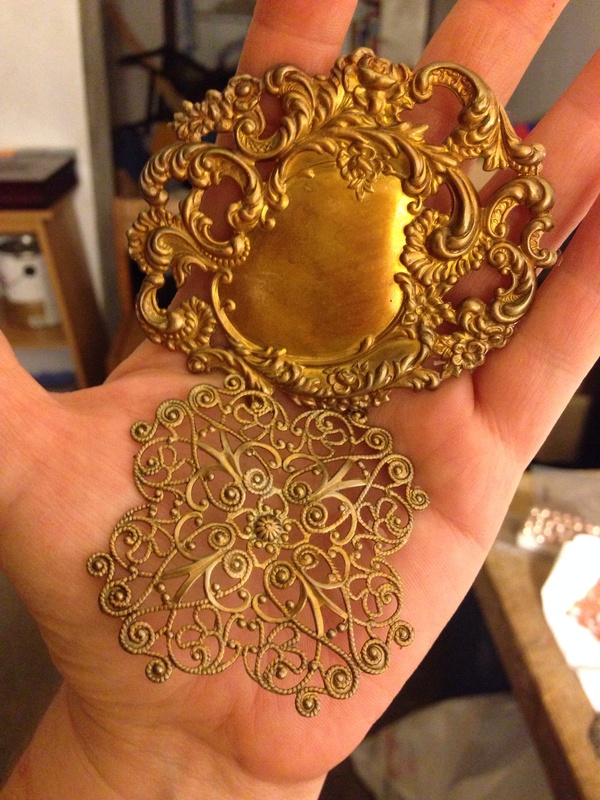 I’m liking how the line is shaping up and I think they are very wearable designs. 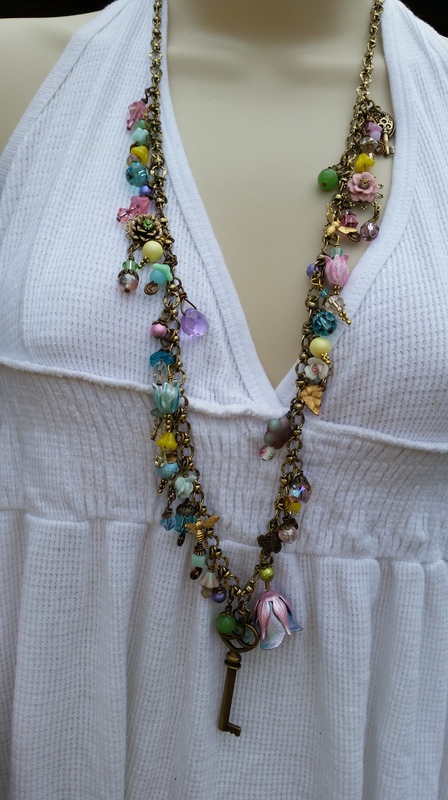 I would love to hear your comments and thoughts on the color choices and style choices. 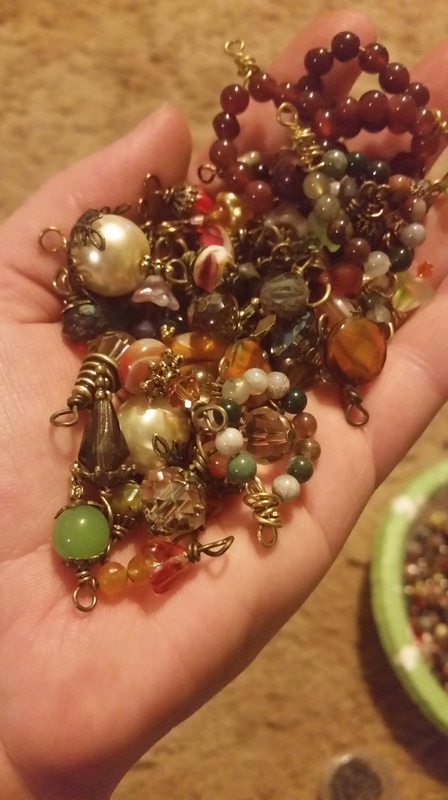 I created the bracelets to be stacked together or worn together on separate wrists and I can’t wait for you t0 see the necklaces which will tie it all together. So, until next time my friends! Until next time. 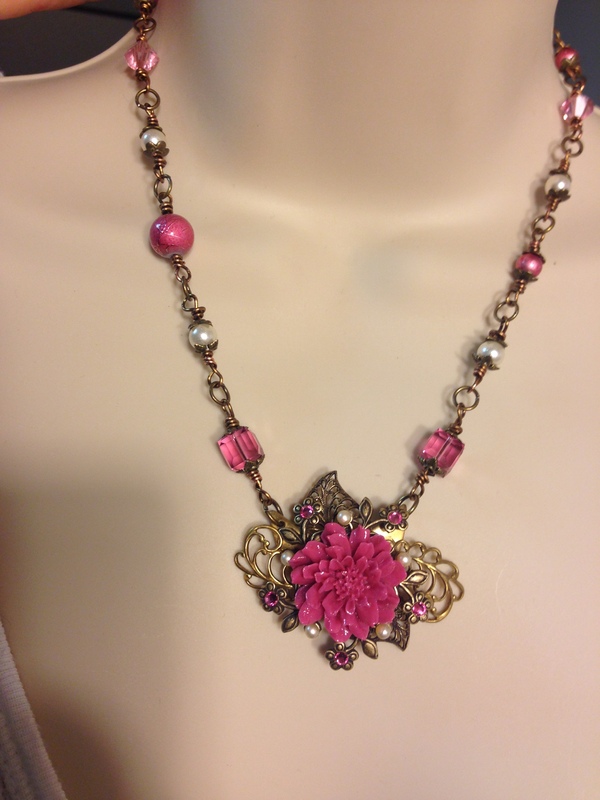 Please visit my etsy shop and B’Sue Boutiques where I get my supplies. It is Brenda Sue Lansdowne who is sponsoring this wonderful challenge/Master Class. 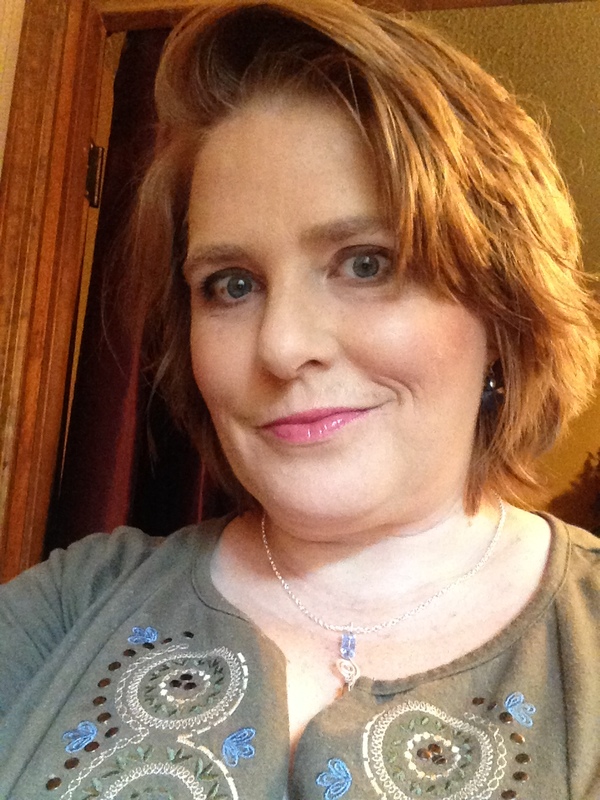 Please see below for your next Blog Hop addresses!!! 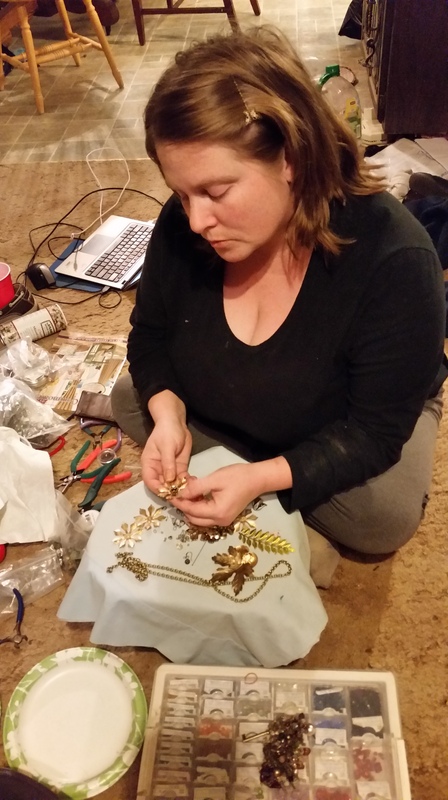 But I recently applied for and was accepted into the B’Sue Boutiques Build A Line Challenge which is a Master Class/Contest that challenges Artists to design and create a cohesive line of Jewelry that can be reproduced. I eagerly accepted the challenge as the next step on my Journey. 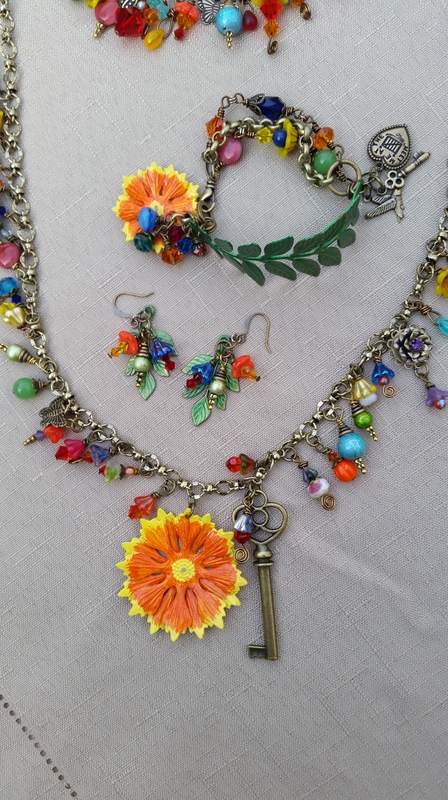 This challenge is sponsored by Brenda Sue Lansdowne, Owner and Artist of B’Sue Boutiques in Ohio. Not only is she a classy Lady but she’s one heckito of an Artist. Please look her up at one of the above links. You won’t be disappointed. 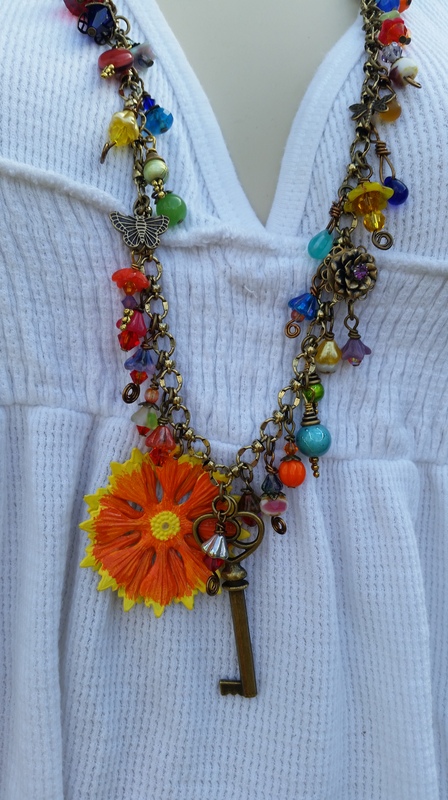 And if you’re a fellow Artist, be sure to check out the B’Sue Boutiques Creative Group on Facebook. This is a collection of fabulous Artists. You don’t want to miss them. So, with the full support of my Family behind me, I embark. 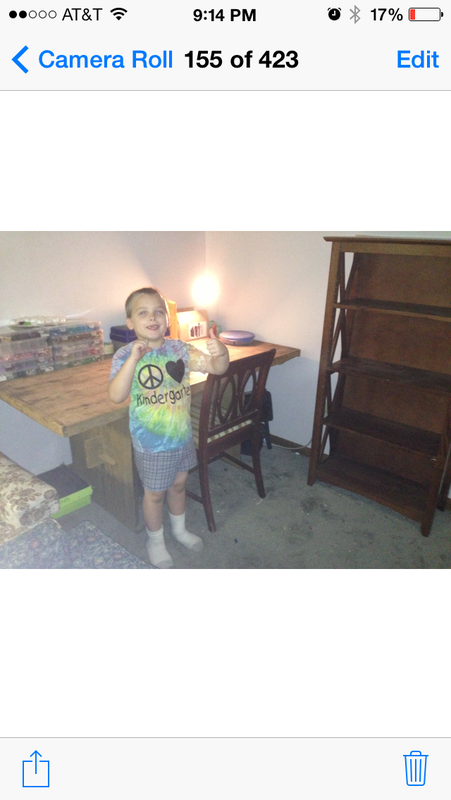 Below is a picture of the Studio the little sweethearts made for me one afternoon as a surprise. I just had to include this picture because it tells a better story of my wonderful little Family than words could ever do. 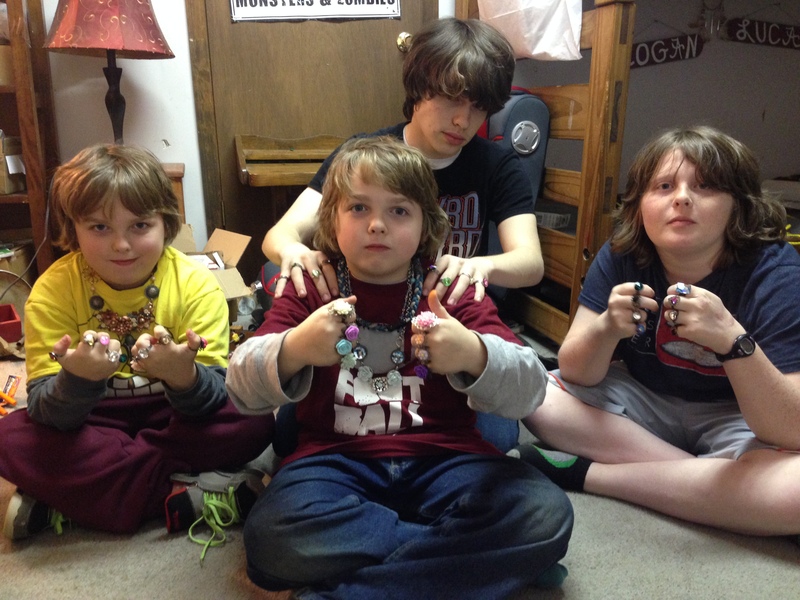 Above is a picture of the four of them posing with some of their Mama’s bling. They may not like “girlie” stuff but they don’t mind helping their Mama if she asks. 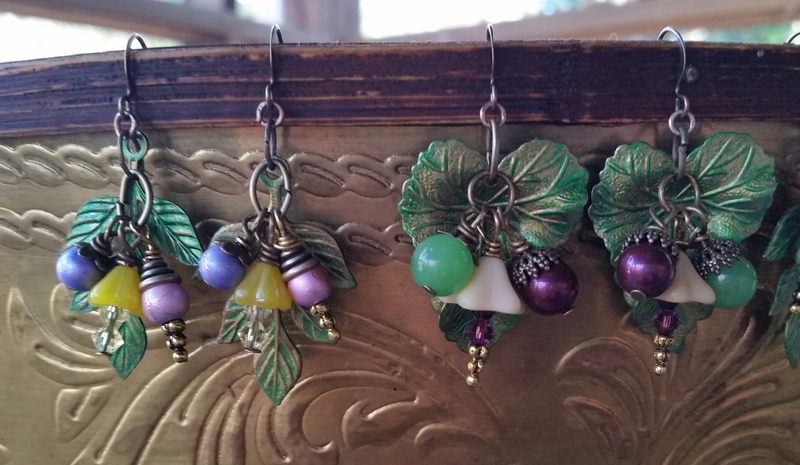 I got started in Jewelry helping my Mom with her craft booth. I sort of caught the bug and began researching and studying on my own. 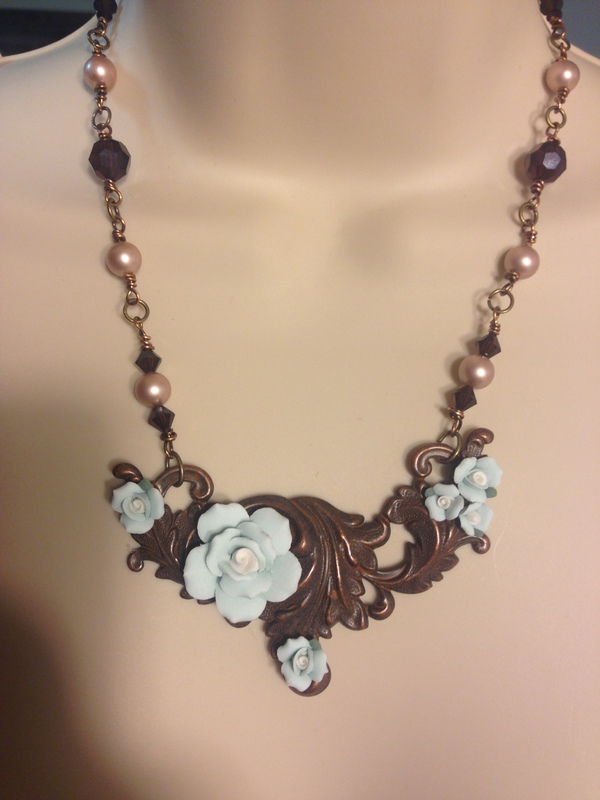 My Pinterest Jewelry board became quite full of designs I admired. 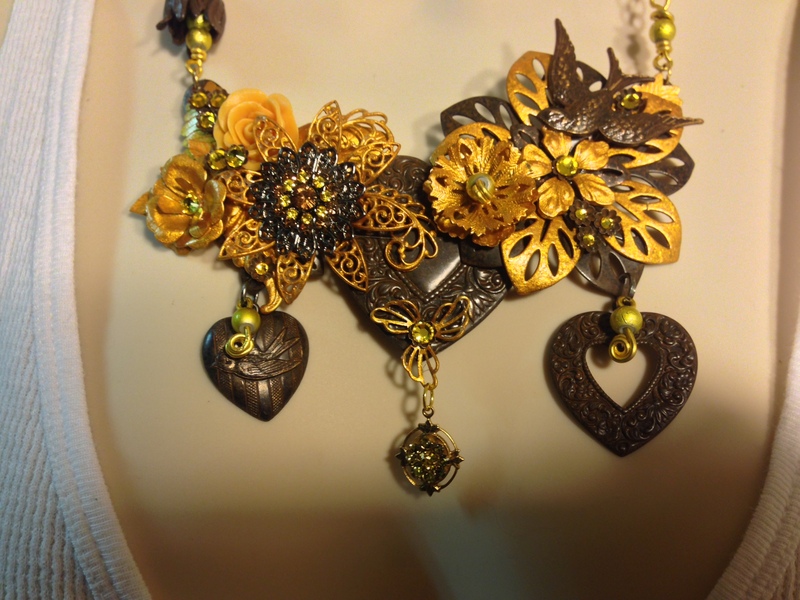 Then, one day I stumbled upon a collage necklace design with brass leaves and flowers that lit up my world. The caption led me to B’Sue Boutiques for supplies and components. Fast forward to today and here I am working with Brenda Sue Lansdowne and some of the most amazing Artists for the Build a Line Challenge. 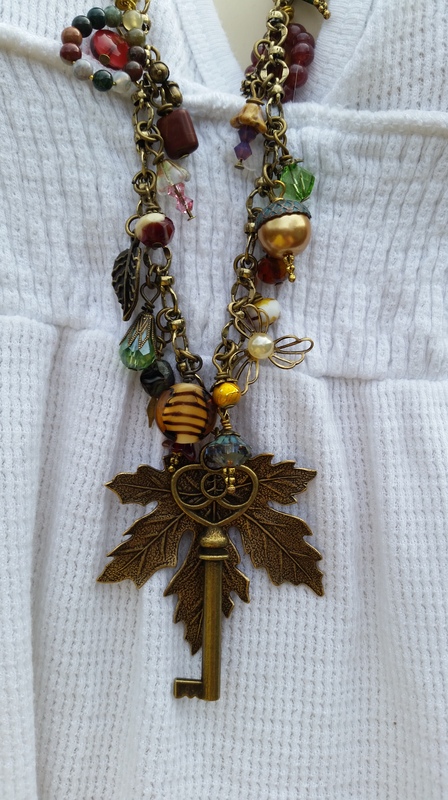 I have named my Jewelry line “Nature is the Key to Happiness” and have chosen to focus on the beauty of the seasons. 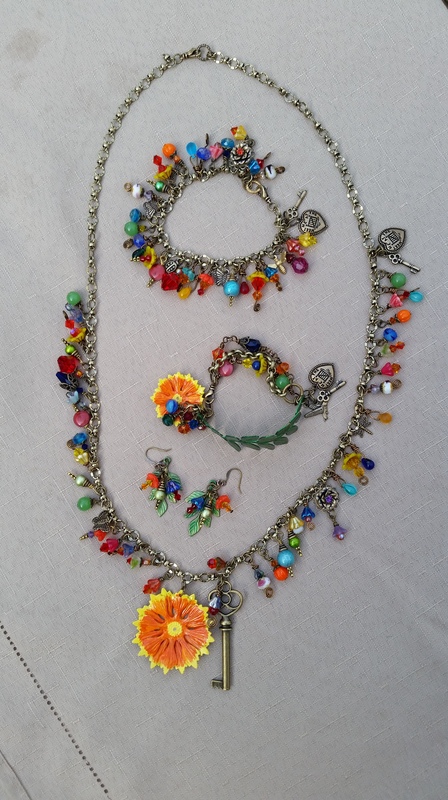 Each season has its own colors and atmosphere and inspires different emotions and that is what I want to express and convey in my Jewelry line. 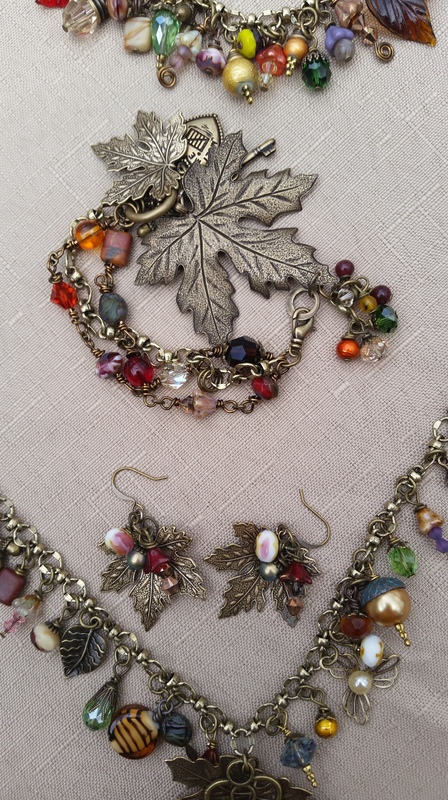 There will be a collection for each season, a set, or Parure consisting of a pair of earrings, a charm necklace, a leaf cuff bracelet and a charm bracelet. Each will have a common theme and color scheme. 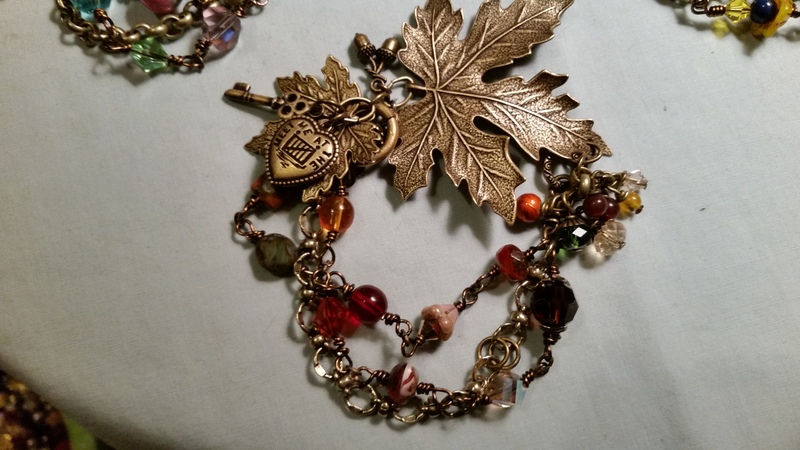 Below is a picture of a Fall charm bracelet I made several months ago to serve as an example of the type of beaded charms you can expect in the charm bracelets and necklaces along with brass charms and accessories from B’Sue Boutiques. 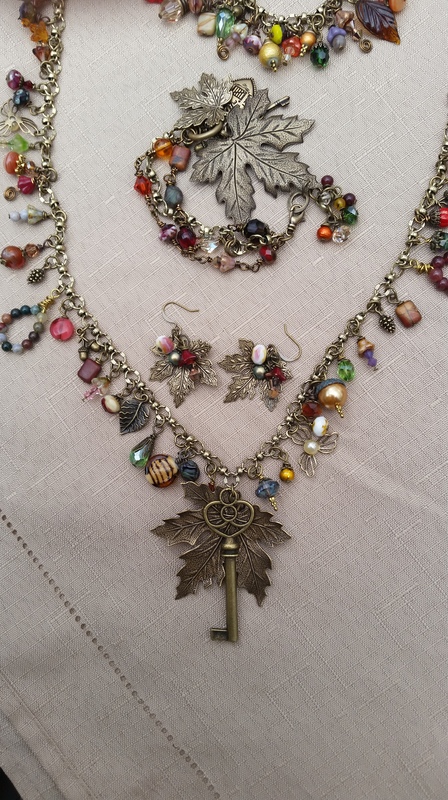 For “Nature is the key to Happiness”, I wanted each piece to have a key and a heart somewhere in the design. 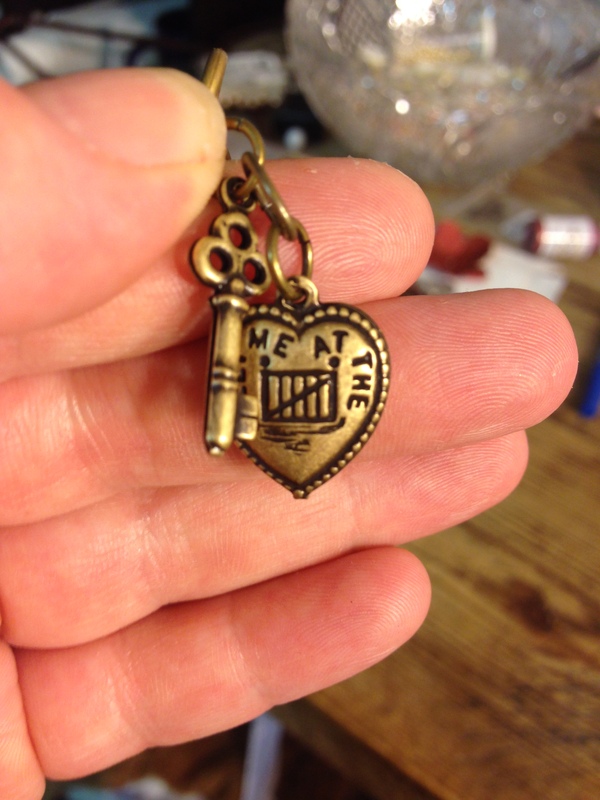 Quite by accident I paired up the perfect key and heart and it has become my logo for this line. Nature is the key to happiness so meet me at the garden gate where nature holds the key. This heart charm reminds me of my Mom so it holds a special place in my heart. 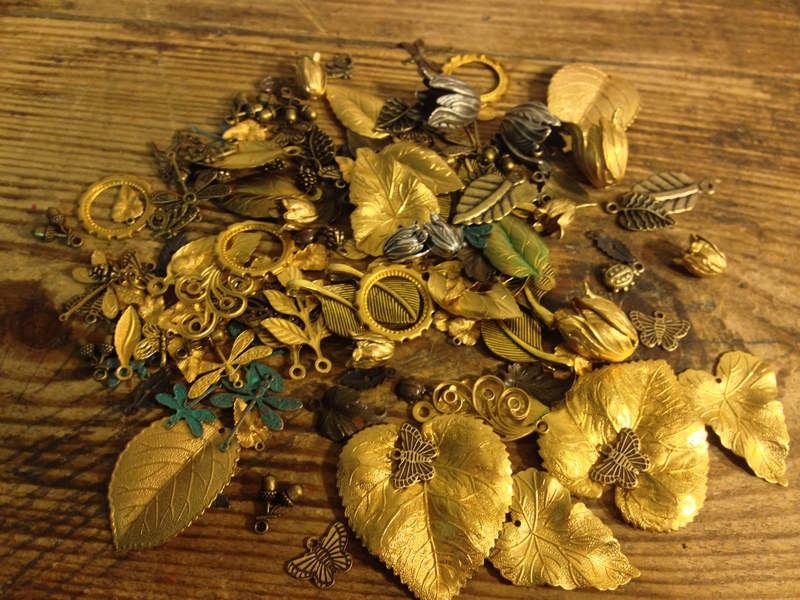 This charm logo will appear on each design with the exception of earrings. I don’t want to give too much away on my first hop but I will tease and tantalize you with Winter. Hellebore is my inspiration for the Winter collection as they are my favorite Winter bloomer creating a bright spot in an otherwise dreary landscape. 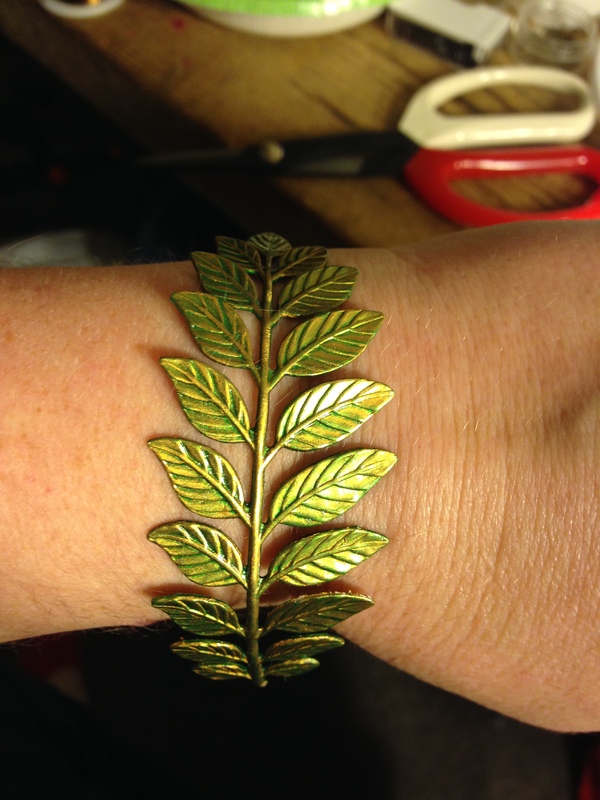 Below you will find the leaf cuff bracelet for the Winter collection. It is nearly finished. I still have a few elements on the way. 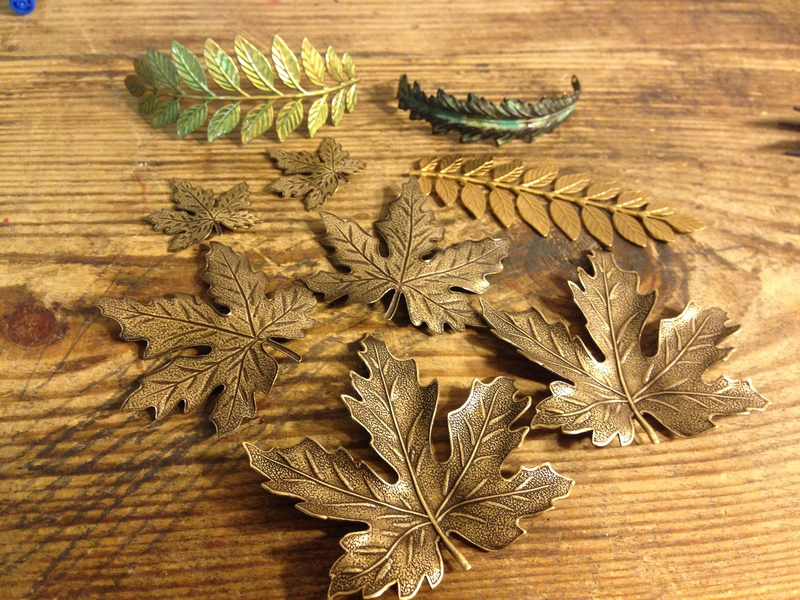 The Fall collection will see a focus on Maple leaves and deep, rich, traditional Fall colors. 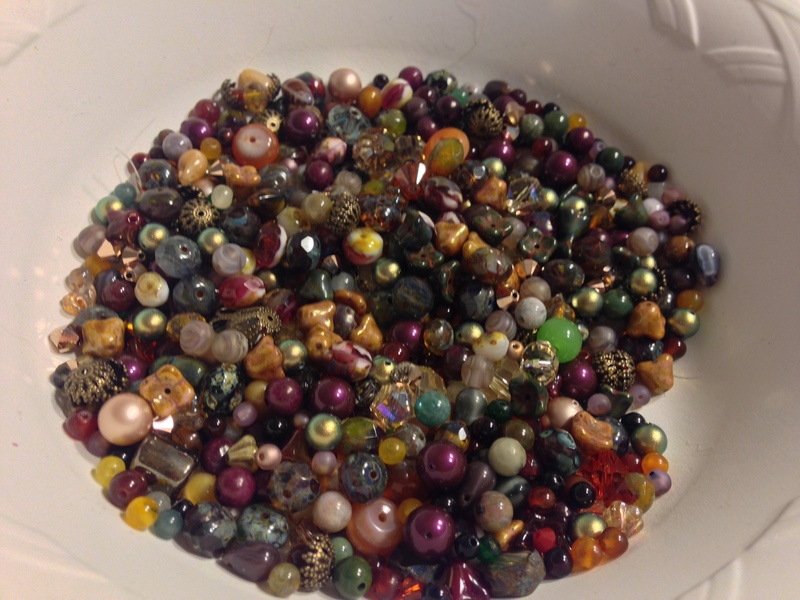 Below are some photos of the beads and components for the remaining collections. 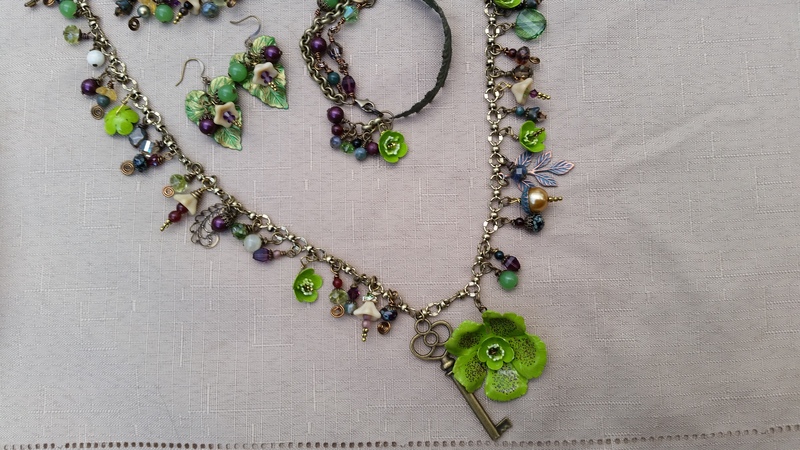 If you would like to see more of my line then you will need to come to the next hop on February 20th. I hope to see you there. 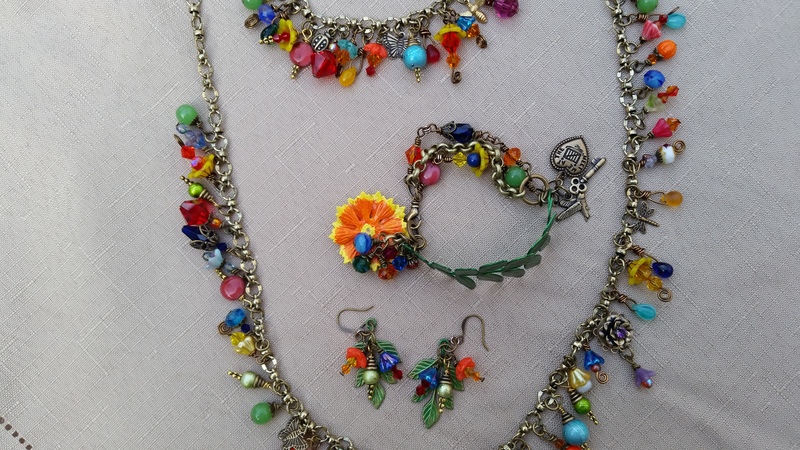 I am hopeful people will love the style and attitude of my Jewelry and keep coming back for the next Season. My brain is already racing to possible expansion opportunities such as multiple styles per collection or even Special Editions. The possibilities are endless and exciting. I am just as curious as you to see where this ends up. Already, the line has taken twists and turns and seen the changing of my mind but it is just too fun for words. We will arrive together. My Collections will soon be available for purchase on my Etsy Shop for affordable prices with pieces ranging from $18 to $50. So, please check back! One final thing before I sign off. 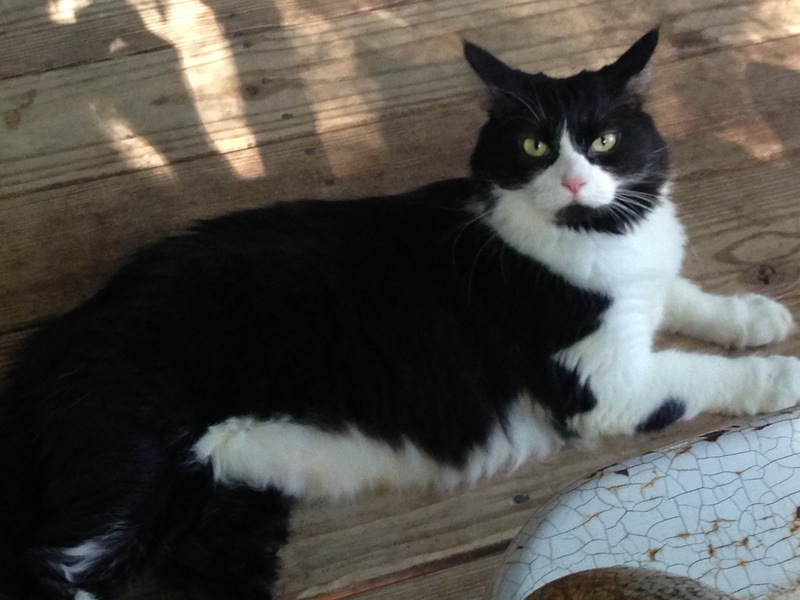 It wouldn’t be fair to not include pics of my little makering buddies. 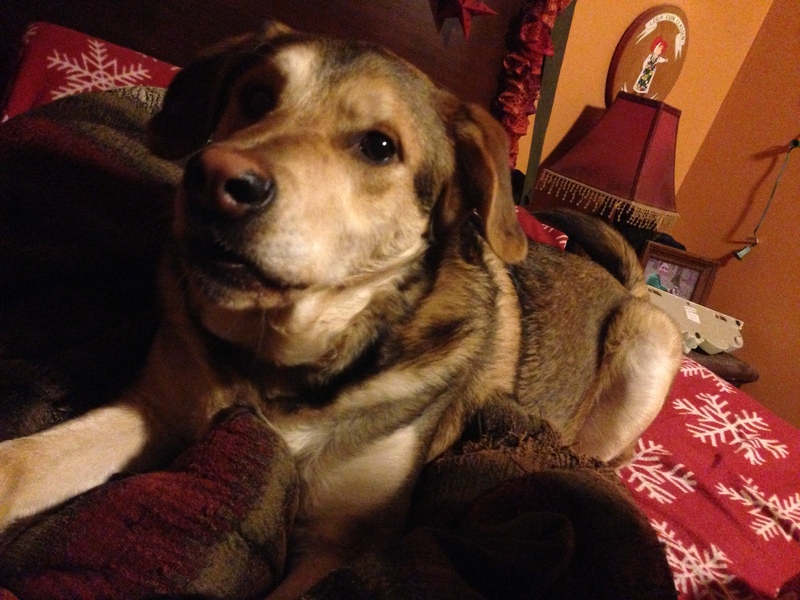 Toby the wonder dog and Queen Rosalee . They are always with me in the Studio. 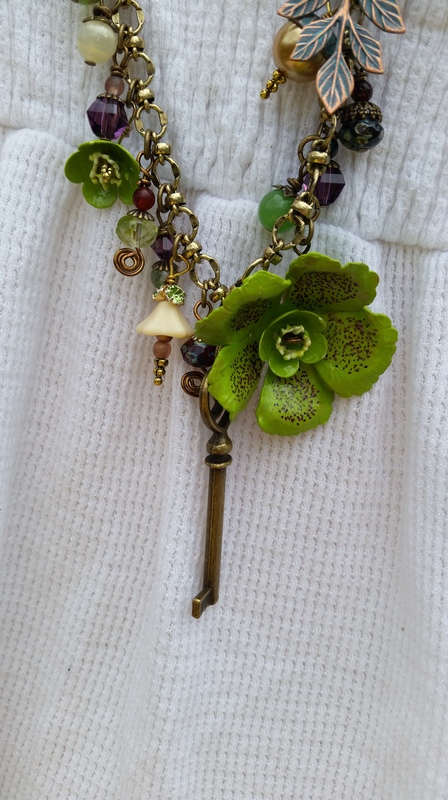 Please see below for your next blog hop address and have a Blessed and Creative day!